It was a call from my elder brother, a doctor himself, that alerted me to the possibility. It was a second call 10 minutes later that jolted me into action. I rushed to the hospital. And found my father on the ICU bed. He was no more. On 31st of March 2002, I was on a routine visit to the Indore centre of Professional Tutorials. It was a Sunday, but an audit was overdue, and I was conducting it alongwith the entire team at the centre. Around 12:45pm, my mobile phone rang. Deep into the audit, it took me some rings before I took the call. "Come to the hospital, Dad is not well", said my brother from the other side. "Sure, I will", I said and continued with the audit, hoping to finish it in another 30 minutes. In just 10 minutes, the phone rang again and my brother, slightly more impatient this time round, said "Come NOW." I rushed out of the office knowing fully well what that tone of voice could mean. And my worst fears were proven true when I entered the ICU of the hospital. My father was on the bed, and a doctor was desperately trying to arouse him from his sleep, pushing a big needle into his heart, with some medicine that's supposed to act as a life-safer in cardiac arrests. I realised that the time has come for me to realise what he had told me earlier on more than one occasions -"A day will come when you will have to realise that we all travel alone, and it is our duty to give happiness to as many as we can in this journey. We must give back to society much more than we take from it." These were precisely the words I used while designing the obituary advt in next day's newspapers. I hope it gave him happiness that I remembered. I also remembered that just 2 days ago, there was an advertisement of PT in local papers, and my father had called me up to congratulate me. That was his habit. Every time a news article or advt of PT would appear in media, he would make it a point to call on my mobile and talk to me. He liked to do that. In fact, those were the last words we had exchanged - "Sandeep, I liked today's advertisement. Nicely done. How are you doing, beta?" And I had sensed that he was unwell. His voice was low, and not upbeat. I had asked him about it, and he had brushed it aside saying it'll go. (In fact, when his obit advt was printed, I suspected he may call me from heaven congratulating me for a good design). My father Dr Govind Shankar Manudhane had come from a very small village named Erandol (near Jalgaon in Maharashtra). He hailed from a very proud family of modest means. His father, my grandfather (a famous lawyer) wanted all his kids to have the best of education. And they did have the best of it. My father's medical education was completed in Pune, Mumbai and Britain, and then he returned to a city he had never been to before - Indore. Like a true entrepreneur, he started his career with almost zero capital, struggling to establish himself as a medical practitioner, and would go for days without a single patient walking in. My mother recalls those days and I can imagine what a struggle it must have been for both of them to manage the clinic with the modest means at their disposal. He got married after he had settled himself to some extent, in the new clinic at Indore, which he had rented at a princely (actually) sum of Rs 300 per month (in the 1960s that was a very big amount). My father always made it a point to publicly respect the first family that helped him settle in Indore - the Jajodias. I learnt a very big lesson - always be grateful for acts of kindness others show towards you. The fact that my father came from a very small village always amazed me. I say this because he would speak (and write and understand) English extremely fluently and effortlessly. So much for those who crib about their rural backgrounds! It was only after my father passed away, that the full impact of the depth of our relationship dawned upon me. Till that day, I had taken the relationship for granted. Here was this hugely successful ENT surgeon, a thorough gentleman, extremely fluent at three languages (so much so that he could easily be confused for being an Englishman, a Malwa native or a Marathi) - my father, who would always be available for advice. So it was a given. But when he suddenly was no more, a strong sense of vacuum hit me. The first 72 hours after his death passed by in rituals, ceremonies and managing the nitty-gritty. It was strange to see a gentleman who would eternally keep smiling, remain still. Totally still. The body being brought home from the hospital, relatives and friends gathering at the home, the ice-slab and formaldehyde injections to keep the body problem-free, the string of visitors to pay their last respects, the final moments when the body leaves the home (that's really a painful one), the funeral, the post-funeral get-together to share emotions and remembrances, the 13 days.. and the final moment when we get on with our lives. It's all a set system. It's all pre-defined. Over thousands of years, the rituals have evolved so wonderfully, and they have been perfected so rigorously, there's hardly a scope for error. There are seniors who magically pop up and guide you at each step - it's truly unbelievable. I distinctly remember a senior uncle telling me just before the funeral pyre was lit "Beta, chehre par ghee zor se lagao, aur khoob sara lagao." I was applying ghee very gently to Dad's face (just before the funeral pyre was lit) but that clearly does not work. They need lots of it. That's practicality for you. One may be emotionally distraught but the process has to be followed absolutely properly. And then the pyre was lit, and all physical contact was lost forever. It's so strange - we hold our dear ones in our hearts, but feel it through physical touch, and when that medium is lost, one really has to dig deep inside one's heart (or mind) and feel it from there. And that can be very painful! In fact, when we went the next morning for asthi sanchay (collecting the bones that remain after the funeral), I felt strange. These were my father's bones!! The asthi visarjan was equally painful. One realises the stupidity of clinging to material things only when one passes through this experience. It all ends, one day. We return to where we came from. Dust. Or call it Mother Earth. The meaning of human relationships became clearer to me, as days passed by. I remembered who all had come to pay their last respects. They say that the measure of a man's success is not seen by the way he lived, but the way he died. I was stunned to see the huge number of very respectable people who kept coming in for several days to our home, sharing their feelings about how Doctorsaab had magically cured them of their maladies, how his gentle touch and smile was still fresh in their memories, and how his diligence has cast an indelible impression on their minds. You really can't see all this when your father is alive. Unfortunately, the deepest of emotions in people's hearts emerge only when someone passes away. As days passed by, I was realising ever more deeply the various incidents that had shaped my relationship with him. I remember vividly how angry he was when I did not perform well in my 5th standard six-monthly exams. He was so upset, in fact, that from the next day (till the final board exams day - we used to have board exams for 5th standard also in those times) he spent 2/3 hours every day with me sitting in the small family garden, teaching me step by step. All those sessions helped me score 95% in the final exams, and to become the school topper, and also one of the state's toppers, winning scholarships. He clapped his heart out in that function. Oh, what love! I doubt if I would have the same commitment towards my children. I might lose patience midway. He did not. I failed to learn from my experiences of the 5th standard, and he had to repeatedly remind me that I could do well only if I really wanted to. And he ensured that his strictness led to really good results all through my schooling. I cracked all exams, including the NTSE exam in standard X, which helped me win a lifelong scholarship (till I would choose to study). The government was lucky, as I stopped studying after my graduation (much to Dad's chagrin)! I remember to this day the name of each newspaper and magazine that he ensured was subscribed to, for the 3 of us (2 brothers, and a sister). All our growing-up years we read tonnes of books, magazines and newspapers. The Times of India, Naidunia, Chandamama, Nandan, Champak, Tinkle, Tintin, Archies, Bal Bharti, The Illustrated Weekly of India, Dharmayug, Indrajaal comics, Amar Chitra Katha... you name it, and we had it coming to our home. Year after year. Today when I look back, I realise that most of what I am is because of that exposure. He would always say "Padho, khoob padho. I'll never let you face any shortage of funds for books and studies." Like a silly fool, once I confronted my Dad with a simple question - "Daddy, all other doctors invest so much in land and property. Why don't you do that?" His simple reply was - "My entire investment is in my three children. I do not intend to leave behind anything but three good citizens." The full importance of what he said was lost on me that day. Today, it hits me hard everytime I recall this! It was perhaps the most profound thing he ever said to me. Every single birthday in my home used to be a true celebration. The mood used to be joyous from the morning, with songs played in high volume (we had an LP record with songs like "hum bhi agar bachhey hote..") almost all day through. Then in the afternoon, everybody would gather for cake-cutting ceremony and a really sumptuous meal, with badaam ka halwa for sure! My Dad ensured that every birthday of each one of the five family members was celebrated with enthusiasm. And yes, he was a photography enthusiast. We still have albums preserved from over decades of every possible event that happened! I have carried that habit with me! I remember my siblings often complaining to my father - "Daddy (and Mummy), you love him more than you love us!" And he would always tell them - "Come on, I love you equally!" And there was a naughty smile on his face. I guess he did love me a bit more ;-) In the very early days (when I was perhaps 3 years old), he would often put me on top of the dining table and say "Naach beta!" and I would dance, and he would sing a nice little rhyme (family copyrighted! ), and everyone would have a jolly good time. I tried that with my kids also, but was not too successful! All my life, I never heard him utter a single abuse, a single foul word. The only one was perhaps "rascal" which he would sometimes use when angry. Other than that, he was a total embodiment of everything civil, genteel, and polished. Always well-dressed, clean-shaven and soft-spoken, his company was much sought after by his friends. His daily work routine was one of high discipline - getting up at 4am, reaching the OT (operation theatre) by 5am, coming home by 9am, reaching clinic by 10:20 am, coming home for lunch by 1:45pm, reaching clinic by 4pm, and coming home by 8:15pm. Six days a week at least. I saw him do this for 30 years. Imagine - thirty years! He was that dedicated to his profession, and to the well-being of all of us. Diwali was always a very very special occasion. At his clinic, there would be an elaborate Laxmi-poojan, and the entire family would reach in time, especially me. Although my motives were different. More than the poojan, I was interested in the special samosas we used to get from the corner-wali shop after the poojan got over. Till this day, I remember every poojan, every samosa I ate, every cracker we burst on the first floor of the clinic (in the middle of a very very busy street). Then we would reach home, and prepare for the evening bash. Daddy was very fond of bursting crackers (not the very loud ones) and he would give my brother and me a lot of money to splurge on this! I have continued the habit till date. And yes, one more thing - he loved Sachin Tendulkar! The day I made it to IIT was extremely special. In the summers of 1989, the IITJEE results were delayed by several months (due to teachers' strike) and we were on tenterhooks till July. Then came the results and bingo! I had earned JEEAIR 647 and made it to IIT Delhi. He was ecstatic as his dream had literally come true. I remember him prodding me since early childhood that "Tujhe toh beta IIT mey hi jaana hai". I did not even understand what IIT meant, but he made sure I realised it was something really worth aspiring for. It is important for parents to keep reinforcing the goals worth-pursuing in the minds of their kids, in their early years. Throughout my IIT preparation days, he was there by my side, at times making tea for me at 2 am in the night. Each one of those moments light up vividly in my mind today, though when I lived through them, they were just another day! And then I passed out of IIT Delhi, and made it to all the IIMs. Again, he was ecstatic. I still remember him telling everyone this with tremendous pride! My mother would often remind him not to praise my achievements so much - "dimaag ghoom jayea iska, zyada taarif mat kiya karo!!" But destiny had to strike its wonderful stroke of a seemingly irrational plunge. Like his true son, I went straight to the garage and started an education enterprise. I started Professional Tutorials (PT) in my family garage on 10th of July 1993, and all hell broke loose. Dad was totally upset with my choice of a career. He thought I had gone mad, or that his misdeeds of past lives were catching up with him (the Bhagwad Gita philosophy). The mood at home was extremely tense for many months in 1993/94. But strangely, I was sure that I could create something meaningful in a teaching career, and maybe create even an enterprise out of it. I was ziddy, totally ziddy (after all, I was his son!). Slowly, in a few years, everyone saw clearly that there was no point in trying to convince me otherwise, and they all started praying for my success (hee, hee!). Ultimately, I did become successful to some extent, and Dad was very happy to see that I had purchased an office, and then even constructed a proper building (in the year 2000). That really made him very proud of me, and I was very relieved (I was scared that if I were to fail, he might feel truly bad about investing so much of emotions in me all through my early years, and it was imperative for me to succeed.) He even came to attend some conferences at PT, where he spoke. It was such a proud moment for ME! Finally, he had realised that I was not all that silly and wrong, and that I could actually do solid things. My Dad kept advising me on money matters, which kept irking my mother always! But he would not stop - his advice would flow constantly. Children, after all, remain children always, for their parents. And that's how it should always be. I can totally relate with this sentiment, when I look at my own kids. There is no way I am going to stop advising them ever!! I have realised a very deep truth about parents. The good deeds of our parents add to the social bank balance of children, that we keep encashing later. As I started working independently as an entrepreneur, I faced several challenges. On many occasions I came across people who went out of the way to help me because they knew and resepected my father. I realised that I had a very rich bank balance that my father left me - the bank balance of invisible blessings, good deeds, & solid karma. Trust me reader, there is nothing more powerful in this life than genuine positive karma. It leaves its indelible traces in the sands of time. Decades after my father helped someone in need, that 'someone' is always around to help me today. Awesome! Another thing he told me on more than one occasion was "This human society is being run only by 10 - 20% of the good people. If they also turn corrupt, it'll all fall apart!" That really scared me. In just another two years, two more of the most senior friends of my father also passed away. One of them, Shri H C Singh, was very close to me and had helped me through the initial years of PT through his strategic advice on various matters. A whole era had come to an end for me. Given his strong sense of humour, on the 01st of April 2002, it was almost as if my father was smiling at all of us saying "April Fool everyone! I am going! Now you are on your own. You better behave well as I am no longer there to take care of you." I was badly upset on many occasions for several days after my father died. Of course, I kept it hidden from everyone (how could I show my weak face!!). Is to do even better for others with all my emotions! sir, according to me this is the best blog written by you. Sir, this was really heart touching. I was taken three months back when I lost my grandfather. I love him like anything, everyday tears come out of my eyes when I think of him. He also taught me many lessons like to be humble, down to earth, respect elders and many more. He is still alive in my heart. Sir, this is an intense, overwhelming piece of personal sharing. Deeply touched... My uncle was your classmate at St. Paul, Indore and I had heard a lot about your family and the family values from him. Truly speaking, these were one of the best learning moments for me, while i was reading this post. The relationship which you shared with your dad, and the rest of your family, the emotional insights blended with the Positive Karmas has touched my soul. Thank You for all your teachings, Sir. Soul touching experience. Read it fully without leaving a single word. Parents are real "Guru" & "Bhagwan" on the earth.In the last but not the least no one can ran away from his/her Karma (Excerpt of Bhagwad Gita). It was truly a heart-touching blog. Really, I am in pune, pursuing my MBA from Symbiosis and it made call 4 times to my dad after reading the heart-breking blog. It really, got me a feeling that I am in Ahmedabad(my native place) and i am talking with my father face to face. It reminds me the current scenario of youngsters of asking their parents to leave home. As they are f no use of them. I dont know how they can say at least it to their parents. It is truly a very bad thing as far as Indian culture is concern. Does Indian culture teach this kind of things? In the 21st century, by doing the 'copy -paste' of western culture, youngsters have truly forgot the Indian culture. If today, one ask any of the young person whether they know any of the 'Shloka' which salutes the parents for their deeds. Hardly one out of thousand can do it. If today's young generation doesn't know it then what will happen to the coming generation? How will they learn the truly Indian culture, its ethics , Morale and all. Its really a hard question to answer, isn't it? Really, its time to wake up and do something for our remaining Indian culture so that it can be passed to the newer ones..
Sir, this blog was inspired me and I read this blog this time I recalls my grand father words, who is always telling me beta "aapani zid par hamesha adag rahavu (Gujarati sentence)". "ye to sach hai ki Bhagwan hai,Hai magar phir bhi anjaan hai, Dharti pe roop MAA BAAP ka,Isme VIDHATA ki pehchaan hai,"
Sir, you have been a source of inspiration for me since I came to contact with you. After reading about your dad, I really think that what you have today in terms of honesty, integrity, etc. is truly given by your father. Sir I truly like this line from your father: "This human society is being run only by 10 - 20% of the good people. If they also turn corrupt, it'll all fall apart!" It is worth remembering lifetime. Sir today I felt very sad after reading about your father. You are lucky sir that you spent this much time with your father. I couldn't do this because my father passed away when I was 5 years old. I do not have much memories of him with myself. Thanks a lot sir for sharing this. Today you attached with me more emotionaly. thank you sir for such a great blog. every one would agree that it is the best blog written by you. 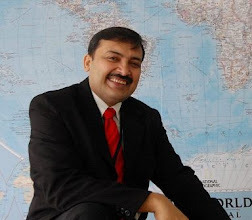 i got immense amount of experience and learnings out of your blog. 9- whole world is here to support and as well as undermine you. I have tried atleast 5 times commenting on this 'expemplary written piece', but was choking so badly depe inside that I had to hit 'close' tab everytime. I am sure you would not believe this..... but I was literally in tears while reading this. It reminded me of my great father who also passed away on 18th July 2005. Everything just ran like a picture infront of my eyes as I had also gone through this tremendous pain & emotional suffering. My father succumbed to death after ailing for alomost an year where he had multiple organ failure. It also reminded me how I always acted & tried to motivate him during his last one year that he'll surely will recover well. Just the same way he used to motivate me while I was studying. One gesture I cannot forget........it was my first job......and the very first day.......I got a call from my immidiate boss that I have to join an office get together in evening at some night out place. I had gone somewhere out.....and the moment I got home so that I could get ready and rush to join my new office colleages at the party........I realised that everything which I was supposed to wear was nealty ironed and was lying on my bed. My father.........who wasnt at all keeping well.....had actually gone to the market to get my dress ready for the forst day at office. I had never seen this ngesture in my life..........and it moved me completely. My father was very happy seeing me getting settled in my career. There is a lot which I wish to write............but Iam again choking very badly while writing this. "please respect and cherish all relationhips you have......enjoy them everyday..................for tommorow they might sieze to physically exist"
I am Mohit mishra from Indore only and I find myself fortunate enough since I have came in contact with you.I did my MBA prepration form PT only and attaend your lectures and till date saw all your gk lectures also. You always inspired me lot more then any boby else in this world I know( after my mother). What You have expressed here is very touching and emotional too.I can feel it how you must be feeling when you were expressing this. I lost my father when I was 1 year old but I have mother who is better then father and while reading your emotions I got the strong feeling for my mother and it made me more closer to her.I am always thankful to you since I always remember the thougths you share in your lectures,blogs,or whichever way it comes from and this I call it another master peice from you. Thankyou soo much for such a insightful thought sharing. This is undoubtedly one of the best blogs that I have read. Thank you Sir for posting this, it made me realize alot of things. I am speechless. thanks for sharing your personal experiences. It was not just a moving experience for me to write this post, but also to read each of these comments. I am indeed privileged. Thanks! Beautiful post, in so many ways! A person is indeed measured best by how people remember him or her. Some months ago a relative passed away, a wonderful senior gentleman. I will always remember his graceful nature. When I called to wish him last Diwali, he said with the utmost sincerity and happiness, "Tumne time nikaal kar phone kiya, bahut achchhaa lagaa!" That simple but wonderful sentiment will echo in my head for a long long time. I loved one thing most that "BOSS,KAR KE DIKHAYUNGA"
Beautiful post i ever read.Thank you Sir. Words will always fall short to explain why tears came out of my eyes while reading your blog. Every line in your blog that was congruous to my experiences of life till now drove very fond memories of the lavish love my Dad showered upon me. I love my Dad too much. Sir your blog is a treasure and I will always preserve it for it reminded me what the purest form of love is. Thank you so much for writing this article. While reading about your Dad and your relationship with him, I was thinking all the time about my Dad and Mom.It just made me realise how granted I take all the love, caring and concerns.Thanks for making me realise that I should not miss even a single opportunity to express my love, gratitude & importance of their presence and guidance in my life. My Dad has allways expected more from his daughter (Me) than his son. His expectation is my motivation, it makes me feel I am worth.He also belongs to a very small town in UP but is setteled in Indore,he is an engineer from MNR- Illahabad, he is now an independent consultant for Wind Power Projects. He has met you once in a flight. Next day in the morning he told us I met a very charasmatic person in the flight today, he runs coaching institute here in Indore, he was asking us, have you heard somebody as Mr. Manudhane ? :) and we all were so excited, ohh dad u met Sandeep Manudhane, and few days after you were on television, on a news channel, discussing CAT prep.He said oh I actually met a very influential person, he was very modest. Once again thank you so much for this article.